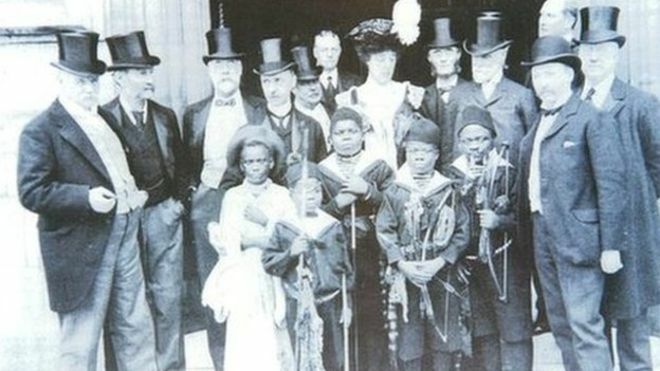 On 1 June 1905 six Africans arrived in London on the Orestes. They had been coaxed from the rain forests of the eastern Congo by big-game hunter Colonel James J. Harrison who arranged for them to go on stage at the Hippodrome in central London. Harrison is not the white male in the above commercial postcard pose, for Britain’s foreign secretary (Lord Lansdowne), alerted by veteran member of parliament and Church Missionary Society president Sir John Kennaway, had instructed the de facto ruler of Egypt (Lord Cromer) to investigate when they had news that the six were on their way to England. Harrison rushed to London; the six underwent medical examination and treatment in Cairo. They followed weeks later. The Hippodrome employment continued into late August 1905. The six, assisted by William and Jani Hoffman, settled to a routine which was broken on Sundays when the theatre was closed. One June Sunday saw them and 16 motor cars travel to Crawley in Sussex (Variety Theatre, 23 June 1905, p 6). On 6 July they were at the birthday celebrations of Princess Victoria in the grounds of Buckingham Palace (The Standard, 7 July 1905, p 6). They were visited in their rooms, a fee-earning arrangement. Hoffman, who had crossed Africa with Henry Stanley in the 1887-1890 Emin Pasha Relief Expedition, thus met the family of Edmund Barttelot who had died there (his death had been a cause celebre and affected Stanley’s reputation). The older women, Amuriape, was ill from a leg wound, and is absent in the photographs of the pygmies at parliament on 29 June 1905 (Benjamin Stone, Sir Benjamin Stone’s Pictures, Cassell, 1908, p 18). At the end of July the six were on show at the Hall, Brandesburton, the Yorkshire home of Harrison (Beverley Guardian, 29 July and 5 August 1905), then were an attraction at Londesborough Park (Scarborough Post, 1 August 1905, p 3). On 25 August the six made probably the first commercial recordings made by Africans in Britain. Five single-sided 78 rpm discs went on sale in early 1906. By that time the group, with linguist-interpreter Hoffman, had toured the Moss-Stoll Empire theatre circuit and appeared for a week at Manchester and Liverpool (October 1905), Edinburgh, Glasgow and a week later Birmingham (November), then west London and Bradford where illness had reduced them to four. They were nursed back to health over four weeks at Christmas. Amuriape had a still-born child in October 1905. They were in Portsmouth in May 1906, Berlin in July 1906, Yorkshire resorts and Grimsby in August, have been located in west Wales’ Barmouth 26-27 September, Eastbourne 2-5 October, and from 24 December at the Olympia showground in west London. Westcliff on Sea (Essex) in late February 1907, Bristol on 25 May, then at the Earls Court exhibition from early June to September 1907. They sailed on the Hindoo from Hull on 17 November and reached the Ituri Forest in late January 1908. They had been seen by over one million Europeans. Images – especially commercial postcards – are far from rare. Jeffrey Green, “‘A Revelation in Strange Humanity’: Six Congo Pygmies in Britain 1905-1907” in Bernth Lindfors (ed), Africans on Stage: Studies in Ethnological Show Business. Bloomington: Indiana State University Press, 1999 was described as “a fine discussion” by Christraud M. Geary in “Pygmy Images” (p 134) in Christie McDonald (ed), Images of Congo: Anne Eisner’s Art and Ethnography, 1946-1958, Milan: 5 Continents Editions, 2005. See also Jeffrey Green “Edwardian Britain’s Forest Pygmies”, History Today Vol 45 No 8 (August 1995), pp 33-39 and entries on Harrison and Hoffman in the Oxford Dictionary of National Biography. Click to go to Arthur G Credland's article on this site. Click to go to a BBC Yorkshire News article.